I just got my Helium a few hours ago. I was stoked! I ripped open the box and pulled it out quickly. I immediately noticed how soft and cushy it felt. Upon laying it on my sleeping pad I noticed how quickly it lofted up. I unzipped the bag and climbed in. It was plenty roomy and comfy. The zipper zipped up easily and even as sloppy as I zipped it up it did not snag once. The cinch cord is easy enough to use and I really like the way the hood cinches around my face. It seems to be more contoured to my head, rather than just closing up over it. I can’t wait to take it out on a trip! The only complaint I have is the weight. I bought this bag expecting a sub 2 pound bag, but whenever I set it on my scales it weighed in at 2 pounds 3.2 ounces (35.2 ounces). Granted this was in the 0.7 ounce stuff sack. I thought this was a pretty big difference in weights since it is being sold as a 31 ounce bag. So, I checked out the hang tags that are placed on the bags with the price and EN listings more closely, and it listed the total weight as being 2 pounds 3 ounces. This verified that there was not much of a weight variation in the listed and actual weights, but it also verified that this bag is selling as a 1 pound 15 ounce bag and actually weighs 2 pounds 3 ounces. This is according to the hang tags on the bag. I did speak with an agent once I realized this, and I was assured I could return the bag for another one. I do plan on going to the store with my scales and checking it out myself before I exchange it though. Other than this hang up, I believe it will be a great bag. As far as using it, I am curious to see how well it repels water. I chose the regular Helium over the EQ version mostly because I was trying to cut weight out, however, with the actual weight of the regular Helium, the EQ may have been a better choice especially since there is only a 2 ounce difference in the weights. After I am able to use this bag (or find another reason to update) I will provide a more thorough report. Update: Not a real biggy, but I had a moment and wanted to post a little more about this bag. I have slept in it both nights that I have had it so far (granted they have been indoors) and I am even in it right now. It is sheer bliss. The bag is super plush, it just feels like it conforms to my body when I lay inside it. Synthetics are nothing in comparison to this. The liner is very thin, but soft and slick. And the hood is quite different form the other hoods I have used. I was a little skeptical about the hood, but it has turned out rather nice. Last night, as well as tonight, I will be using a Jag Bag Hi Tech Mummy fine silk liner with the bag. I slept comfortably with it last night in the Helium. I was afraid that I would get tangled up inside the bag with the liner, but it did not happen. Even when I roll over on my side. (And when I roll over on my side, I roll inside the bag rather than rolling the whole bag with me.) The silk liner just slid across the liner of the sleeping bag. Also, the liner covered up the annoying stitching on the inside of the bag. I am still impressed with my bag though. I will be sure to watch the little annoyances though throughout time and see how they progress. Update: Ok, so today I was playing with my bag, and decided to try to see if I could really get all of the down to shift side to side in my bag. The great thing about this is that 1. On warmer nights, I could shift all the down off the top of the bag, this way the bag is not as hot, and 2. On colder nights I can shift all the down from the bottom to the top of the bag. This makes sense because when you lay on the bottom of the sleeping bag, the down becomes compressed, resulting in a lack of insulating abilities. Down must be lofted to provide thermal efficiency. So, technically all the insulating material in the bottom of the bag is useless, and can be viewed as extra unwarranted weight. This is why some desire quilts – which have no bottom side so they are less weight and provide the same function. Also, a company called Bug Agnes specializes in sleeping bags which feature a bottom, but without insulation. All of the insulation (down or synthetic) is in the top of the bag. 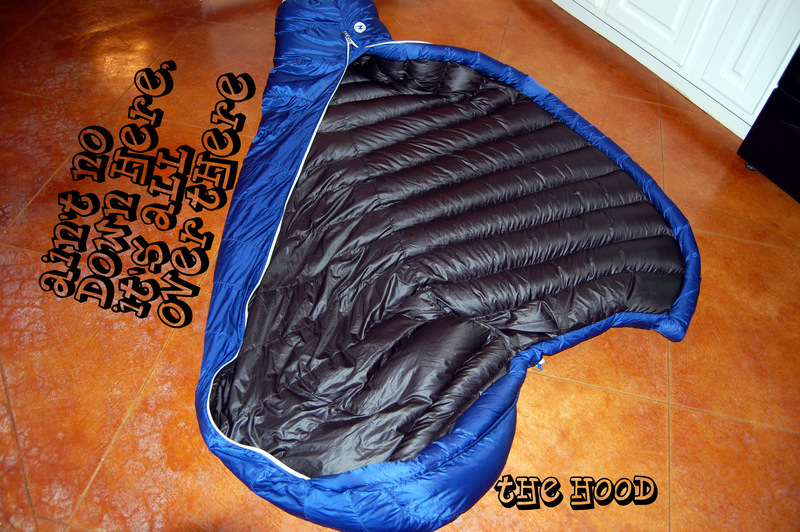 The bottom features a sleeve which holds a sleeping pad in place. 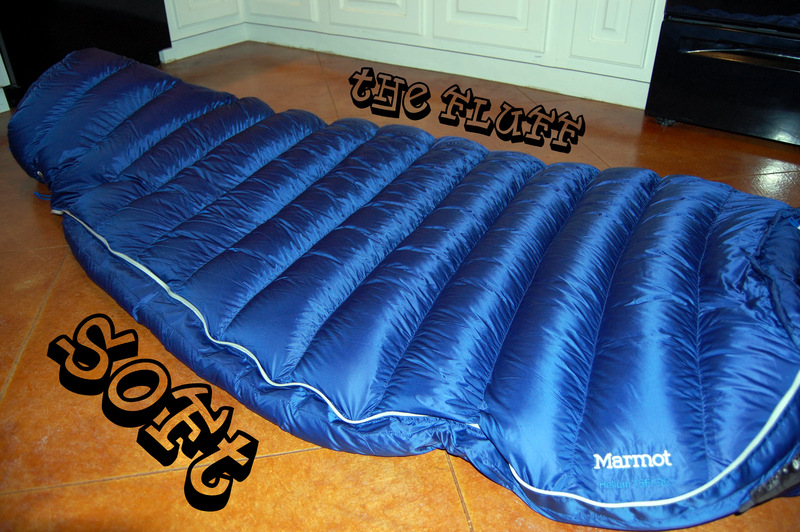 The sleeping pad is what provides the insulating factors to your bottom side. So, I can take all 19 ounces of 850+ down and fluff my bag to move it all to the top of my bag. Ideally, this would improve its rating, with a proper pad below me. However, I am not sure if this is done when the temperature ratings are figured. I will contact Marmot and question this, as well as check it for myself once the temperature comes around! Thanks Stick, great review. Anymore prob. With the bag getting wet ? How is it holding up ? I have really come to love my Helium… so much that even during those times I have found myself really drooling, and wrapped up in the specs on both a WM bag, as well as a FF bag, I just couldn’t part ways with the Helium to get either of them. Now, I am not saying that the Helium is “better” but I am saying that I can’t see any reason for me to swap it in for either of them. As far as the DWR, it works ok. The worst times that it has been wet was when using it inside a nonbreathable bivy. The material is lightweight, and moisture can move into the insulation, however, due to this very same nature, it also makes drying the bag out quite easy too. Nice info Chad. I just picked one up a Helium and was wondering how it works with all the down shifted to the top? I already had a Big Agnes Lost Ranger which is a 15 degree bag and found it to be a comfortable sleep system because I roll off of my Neo Air and other pads frequently. It has the built in sleeve and no insulation on the bottom, but I was able to save 14oz. by switching to the Helium (probably attributed to the 850 fill.) Does your Helium do well with all the down on top? I was thinking that maybe because the down will be compressed a bit it may not insulate as well? I don’t ever shift all of the down to the top of the bag because then it is really stuffed, so instead I shift a majority of the down to the top and sides. I have found though that with some down on bottom, it will actually fluff up around my sides and my legs a little which I can only imagine helps a little too. I am happy with the bag though. I have cowboy camped with it and my NeoAir with a 1/8″ GG Thinlight pad on top of the NeoAir down to about 18 F and was comfortable. I have slept in it inside a tent down to almost single digits and been fine. All in all, I have been very happy with this bag and I am looking forward to getting it back out soon! Hope you enjoy your new bag! Thanks for the reply. I am pretty excited about being able to get out there with the “new” bag as its tag said it was a Spring 2010 bag, but I picked it up at an REI garage sale for $50 so the price really helps add to the enjoyment. 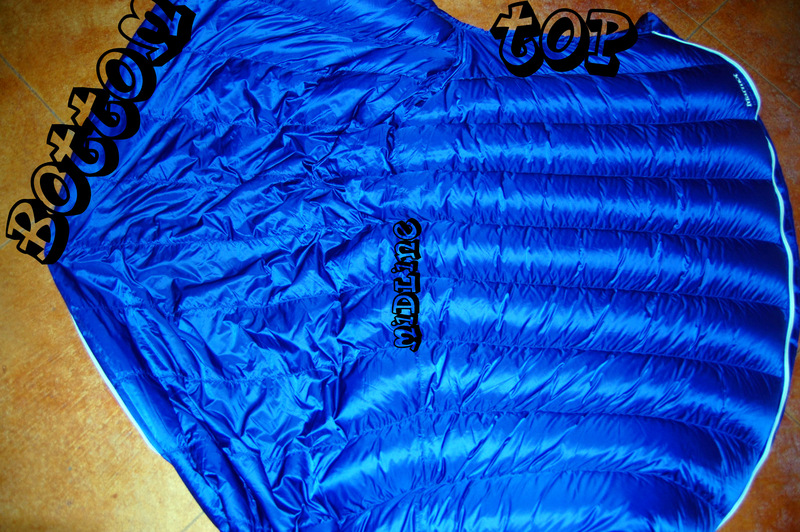 ok…Stick…I can’t drop no $400 on a Marmot Helium Down…I am a huge Kelty advocate, so I have a Kelty Light Year XP (Ultralight) +20 Synthetic bag…I do want a different bag…not because I need one, but I would use my Kelty for summer time (it has a zipper at the bottom where you can let your feet hang out. I know it’s +20, but I can use it for summer, I think. Since I can’t swing the $$$ For the Marmont, what is another good option for me? (For a winter bag). Right off hand, alot of people say that the Campmor down bags are quite the quality/budget bag. They have both the 20* and a 0* bags. But I gotta tell you, if you ever do have it, go for it. This bag is super comfy and warm, and light! I am very happy that I went for it.